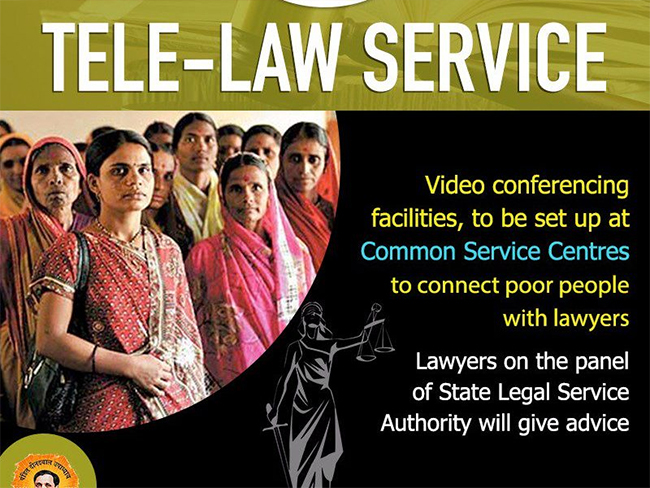 The Tele-Law Scheme is a project which is in association with National Legal Services Authority (NALSA). According to this scheme, the people shall get legal aid services at the panchayat level now. Basically it will become easier to access the legal aid services because they will be available through the Common Services Centres (CSCs) now. The Tele-Law scheme has been launched by the Central government of India. The scheme is already launched in states like Assam, Uttar Pradesh and Jammu and Kashmir. In Bihar it launched on August 2017 in the presence of prominent officials and ministers like Sushil Kumar Modi, Rajendra Menon and Ajay Kumar Tripathi. This scheme is called the Tele-Law scheme because that is the name that the portal will get, where people can directly go and receive legal aid. Such video conferencing can be arranged at the CSC which is located at the remote village as well. They will connect with paralegal volunteers or PLVs. The villagers will be able to contact the PLVs for their various issues. Around 1000 PLVs shall be hired for this – all of this will be women. Therefore the scheme will also aid in empowering women. There will be 500 CSCs all over the state and in these CSCs there will be two PLVs each to assist with the legal matters. Such centers shall also track the progress of the applicant’s cases and maintain a record of the same with the District Legal Service Authorities each week. They will be available 10 days a month in the villages. It shall come forth across 1000 panchayats in Uttar Pradesh and Bihar. The legal consultation will cost only Rs. 30 for the villagers but for BPL people, this amount will immediately return to their account. The PLVs shall get a remuneration of Rs. 500 instead of Rs. 250 per day which they used to get until recently. This shall be on a per day basis depending upon the day when they are providing their assistance. There are no laid down guidelines or eligibility criteria to seek legal assistance. For the PLVs, the eligibility criteria may be announced later. However, anyone can take the help of this scheme. It is open to all residents of the country. Since this is a teleconference scheme, this means that since it is a scheme where you are seeking legal assistance, no documents are required. You may however carry the legal file with you but the same is not mandatory to seek the legal counsel during the video conference. Anyone can take legal assistance via this scheme.